Last week was a busy one. Ending summer vacation is usually one week that is crazy for me and many others like me. It’s filled with back-to-school Open Houses, school supply shopping, all tied in with my work juggling act, among the regular chaos of my week. How do I balance it all? I just do. It is what is expected in my Mom role. Just get it done and hit the restart button the next day. There is no award waiting for me when the kids successfully make it back to school and become well-adjusted, but there is gratification in knowing I did all I could to set them up for success. My youngest is starting a new school and that comes with new adventures, schedules, teachers, friends, experiences, and so much more. But for a teenager it can also come with stress, anxiety, fear, and a host of other feelings as she wonders how she will fit into her new surroundings. For now I am focusing on the positives and using this change as a teaching moment to show her how to attract and find good solid friends. The friends who will be by your side when you need them versus those who judge you for being new, dressing differently, or not being the most popular kid on day one. Will it work? I don’t know but I am going with my gut and encouraging her to be her and let the rest fall in place. When one can learn to adapt to new environments, new challenges, and be true to herself she will feel empowered to tackle the unknown and be fearless as she grows older. Fingers crossed as the weekend rolls into the weekdays with new routines, new people, and the shock of being back-to-school for her. Meanwhile I will be doing a party dance as I get my routine back, my space, my focus and everything else that goes out the window during summer break. It’s been a capital-c CrAAazYyyy week for the 2 Chicks. Chick 1 has had some teen drama to deal with on the home front. Chick 2 has had teen independence issues of her own this week. Different varieties, still exhausting. In addition, both Chicks had professional trainings and speaking engagements to manage, on top of running households, parenting our other children, trying to eat healthy, fulfilling our regular work responsibilities, and getting to the gym each day. On most days moms flip roles so frequently that others around can easily take their ability to shift mindsets for granted. We prefer to think in other shapes instead, like circles. We are both lucky to have close inner circles of trusted friends and family who can close in and keep us upright when life is out of balance. Those circles are filled with people who can connect us with resources, reassure us with their common experiences, or just listen and jump in to do just about anything when needed. It can also be a web that will catch and support as we find our center again. This is a mom’s world. A working mom’s world. A community approach to managing life’s daily challenges and this community usually exists behind the scenes of the four walls of our homes. Of course, as with most thing Chicks, we each have our own twist with our circles. Chick 1 likes the infinity symbol. It’s two circles or loops, showing the interconnection of her family, her friends, her co-workers, her mentors, and the loop means the boundaries are limitless. 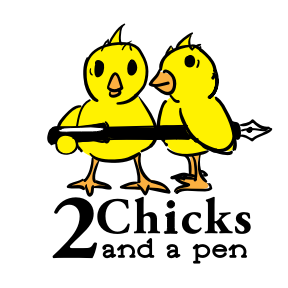 Chick 2 sticks with the smaller, more simple circle. Trust is difficult to give and only a precious few will gain access to her inner circle. It requires deep connection to help her manage her complex world. But when things go sideways, she is always glad to have those friends to recenter her. Maybe your shape is a diamond. Maybe it’s a pyramid. Whatever your shape, remember and consider those who make it up carefully. As we’ve been reminded lately, these central connections play a vital role in keeping our balance – mental, emotional, and social.